Maple for OS/2 requires Warp. The program installs effortlessly; you simply tell it where to put the files, and which files to install. A minimal installation requires 18 megabytes of disk space, and a full installation, including extensive example worksheets and user-contributed packages, requires 28 megabytes of space. The minimum RAM requirement is 8 megabytes, and the documentation lists a 486 as the minimum CPU. The heart of Maple is its kernel, the engine that performs the symbolic and numerical computations. The kernel is robust and optimized for speed and efficiency. The Maple library, gives it extensive built-in functions for doing a wide variety of calculations from calculus to linear algebra to statistics. What makes Maple very powerful, however, is the ability to modify or extend the built-in commands to suit your own needs. Using the Maple programming language, a simple but very powerful programming language, you can overcome any limitations you might run into with Maple's built-in commands. Powerful commands are not useful if you don't know how to use them, however. Maple ships with excellent documentation that will have you acting like a math wizard in a matter of minutes. The Learning Guide starts with the very basics of how to enter commands and through its 263 pages, shows you how to find solutions to equations, create graphs, evaluate and simplify expressions, and read/write data to/from disk files. The Programming Guide shows you how to use Maple's programming language to solve problems that would be quite time consuming to solve in more traditional languages like FORTRAN or C.
The Maple Handbook is a 476 page, spiral-bound reference of the built-in Maple commands. This book is very handy when you are working on a problem, and can't quite remember the option of a particular command that you need. If you need more information on a particular command, it lists page(s) in the Programming Guide and Learning Guide where you can find information on that particular command. And on top of all this printed documentation, Maple comes with on-line help that is extensive and easy to use. The worksheet interface is much more than a way to get nice output that looks like equations as opposed to poor renditions done in ASCII art. It is a full-fledged document editing tool that enables you to effortlessly combine text, equations, graphics, and even hypertext links to other documents. Complex documents can be outlined, enabling you to collapse and expand sections and quickly get to the information you are looking for. The on-line help for Maple is a Maple worksheet, for example. As you would expect, the interface enables you to cut and paste both text and graphics between it and other programs. I had no problems pasting figures from Maple into PMView and DeScribe. Say, what does that function look like? Maple draws it faster than you can think "Where is my graph paper?" And if you need to change the way the plot is done, a right-click on the graphic brings up a menu of parameters for the plot such as the type of axes to use, the symbol or line type to use, etc. With 3-D plots (GIF, 15k), you can even change the point of view by clicking on the plot and dragging the mouse around. You can also change the perspective and lighting of a 3-D plot with a click of the mouse. Now that I have praised the graphical interface, let me point out that Maple also ships with a text-mode version that can be very handy when you just need to do a quick and dirty calculation. However, the real power of the text-mode version reveals itself when you use REXX as the glue to piece the Maple engine together with other programs. You can have one program create some data, then have Maple do some processing on it, and then have another program do something with the output from Maple, all done automatically by a REXX script. Waterloo Maple has announced that they are making Maple an OpenDoc application. OpenDoc is the future of interoperability in programs, and would enable you to embed a Maple object within a DeScribe document, for example. Not everything is rosy when it comes to the OS/2 version of Maple. It is clear that this is a program ported to OS/2 from another platform. There is no "Maple Document" template in the Maple folder. WPS integration is basically limited to having an association set for Maple documents so that they load into Maple when clicked. Drag and Drop printing is not supported. You cannot even drop a Maple document on the Maple window and have it load. Even more annoying is the fact that the program is not multi-threaded. If a complex graphic is being rendered, you will sit there and stare at the clock cursor until it is done. Now, I realize that such threading would be much more complicated to program, but even printing is done on the main thread, meaning that you are locked out of the program until the print job is spooled. That is simply inexcusable. This being the first version of Maple ported to OS/2, there are still some rough edges on it. For example, choosing "Print Preview" from the "file" menu has the same effect as choosing "Exit" -- the program shuts down completely with no error message of any kind. I also had some problems with printing documents (equations being jumbled), but it seems that the source of the problem may be the LaserJet driver I'm using because the equations looked fine when the document was printed to a Postscript file and viewed with Ghostview. 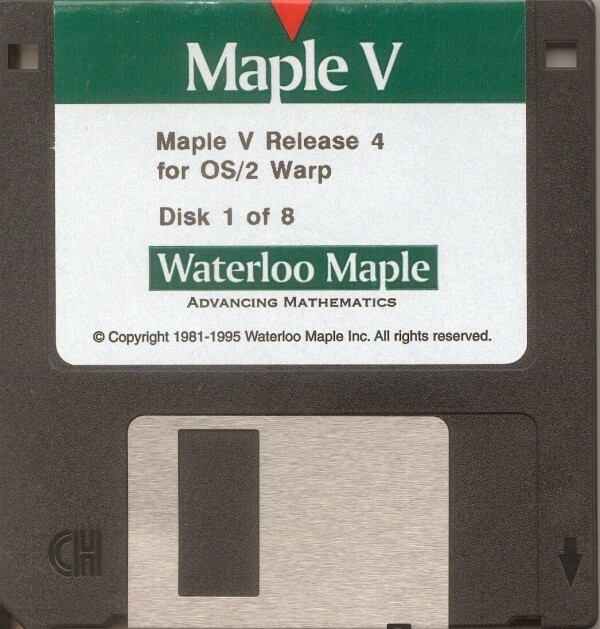 Although there are some minor problems with Maple V for OS/2, I have no reservations about recommending it. Its interface is intuitive and very flexible. The kernel is robust and efficient. If your work involves data analysis of any kind, be it anything from photometry of stars to fluctuations of customer demand for your products to the mixture of nitrogen and oxygen in your scuba tank, Maple V for OS/2 is a very powerful tool. Unfortunately, the list price of this package is astronomical -- US$995 ($795 with the academic discount) -- and, like Mathematica, there is no student version for the OS/2 platform. Frankly, I think these companies are missing a profitable market by not having a slimmed-down version in the $100 - $200 range for students and people whose needs are less demanding than professional scientists and engineers. Dr. Dirk Terrell is an astronomer at the University of Florida specializing in interacting binary stars. His hobbies include cave diving, martial arts, painting and writing OS/2 software such as HTML Wizard. 이 제품은 상용입니다. 디스켓이 있길래 올려 봅니다. 소개 기사는 os2ezine.com 에서 퍼 왔습니다.